As curtains close on the 21st session of the Conference of Parties (COP21) on climate change in Paris after 12 days of negotiation, Africa has demonstrated to the world that it is possible to invest and develop using climate friendly means. With clear examples, several African countries demonstrated how they have invested in climate friendly projects such as renewable energy, climate smart agriculture, agroforestry, tree reforestation, and many other projects that limit emission of greenhouse gases into the atmosphere. In a project known as ‘Ten million trees, Ten million Souls,’ Benin, a small West African country with a population of just ten million people demonstrated how it managed to plant 30 million trees in just three years, challenging many huge countries with huge populations in the world. Benin’s case was President Thomas Yayi Boni's dream for each and every citizen in the country to plant at least one tree every year, which came to pass. “It was important that the president had a dream, and with little support from bilateral donors, we managed to establish nurseries all over the country, which enables us provide tree seedlings to citizens free of charge,” Théophile Kakpo, the Director General for Forests and Natural Resources said during a side event at the Africa Pavilion in Paris. “If all African countries could emulate Benin and have each individual plant a tree every year, then we will be able to solve most of the climate change related problems facing us today,” said Dr Fatima Denton, the Director of the Special Initiatives Division at United Nations Economic Commission for Africa (UNECA). In a different event, Belaynesh Birru, Director, Ministry of Water, Irrigation and Electricity in Ethiopia explained how the country has been able to invest in green energy, and is now taking the lead on the African continent. “Climate change is not a future possibility for Ethiopia. It is a present reality,” said Birru. It is because of this that four years ago, our country embarked the Climate Resilient Green Economy (CRGE) strategy that will help us to realise the ambitions of reaching middle income status by 2025,” she said. So far, Ethiopia has invested heavily in hydropower, wind, geothermal, solar, and bio-mass sources of energy, and is developing an energy policy to create a good environment for the country to increase its renewable energy mix. However, despite all these efforts that have resulted in production of energy that is supplied beyond borders, studies show that the country is exploiting only five percent of the possible 45,000 megawatts of hydropower energy, only one percent of the solar energy, only one percent of wind energy, and only one percent of the geothermal energy – which has a potential of 7000 megawatts. “We have not even exploited 10 percent of our total renewable energy mix. With availability of finances, we can produce enough clean energy that will help us leapfrog to development without causing any harm to the environment,” said Birru. And now, with the Africa Development Bank (AfDB) committing to triple its investment to climate change in Africa by 2020, countries like Ethiopia will be able to exploit more green energy, and move towards development without polluting the environment. Today, Ethiopia produces a total of 4140.30 megawatts of renewable energy derived from hydro, wind and geothermal sources. Kenya is another country that has invested heavily in geothermal energy source, which does not depend on weather and climatic conditions as it is the case with solar and hydro. In general, geothermal now accounts for 51 percent of the national power mix in Kenya, while hydro, which was the leading source of energy some months ago now accounts for 40 percent. Other sources including thermal and wind account for the remaining nine percent. “Time has come for Africa to move forward,” said Dr Carlos Lopez, the Executive secretary - Economic Commission for Africa (ECA). “When it comes to industrialisation, I believe that Africa can leapfrog. But we need to empower them with renewable energy, then we can also adopt clean platforms so as to avoid repeating mistakes of others,” he said. According to Dr Adesina Akinwumi, the President AfDB, there cannot be growth in Africa without electricity. 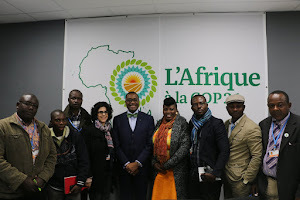 “It is important for us to light up and power Africa very quickly, because if we don’t do that, most of the trees we are planting even for the great green wall will be cut down for charcoal,” he said in one of the side events at the Africa Pavilion. Many other African countries have started investing in green energy generation, climate friendly farming systems and reforestation, and have pledged to continue doing so through their respective Intended Nationally Determined Commitments (INDC). “We appreciate the potential we have in Africa, but we must understand that nobody eats potential. It has to be unlocked for it to make sense,” said Akinwumi. The outcome of the COP21 will determine how the world intends to reduce greenhouse gas emissions amid the quest to keep economies booming. And African leaders have demonstrated that it can happen without polluting the environment. Thanks to share this valuable information. you may also follow : Global Weirding News to know latest news.